On America Recycles Day, the Solid Waste Agency of Lake County and other agencies and communities around the state released a new set of guidelines for recycling. Since then, discussions with local recycling facilities have led to a few new updates. 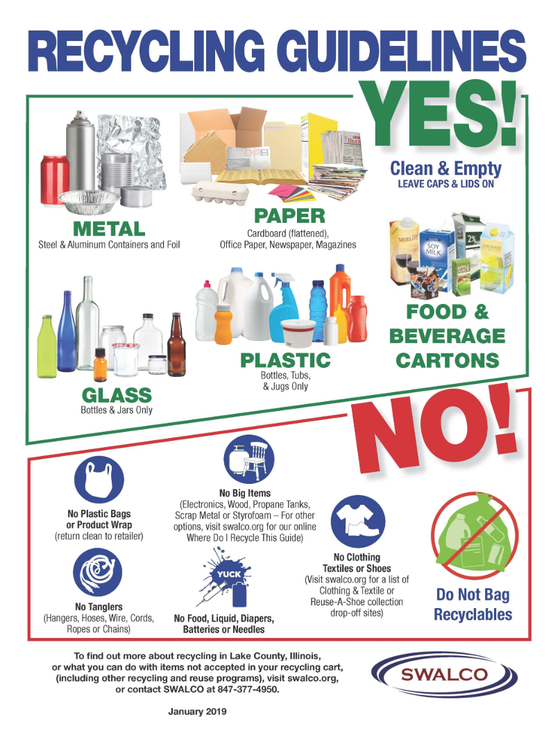 Please find the “recycling reboot,” the latest Lake County Recycling Guidelines. Take a special look at the NO list as these items can negatively impact recycling efforts in many ways. It’s estimated that as many as one in four items placed in a recycling cart is not accepted for recycling. A New Year is upon us, and it’s a great time to review and make sure you are getting all the right things in and keeping all the wrong things out. You can find alternative recycling and reuse opportunities available in your community at swalco.org, along with more detailed information and frequently asked questions about recycling. Donate your holiday tree to us and we’ll recycle it into woodchips for trails and landscaping at forest preserves throughout Lake County. Bring your tree to a drop-off site through Feb. 1. Do you have strings of lights that you don’t need or that don’t work anymore? Don’t throw them away! The Solid Waste Agency of Lake County offers four locations across Lake County where you can recycle those lights for free. Visit the drop-off locations. Make sure you don't throw away your old electronics! Items such as TVs, computers, video game consoles, tablets, and printers are prohibited by State law from being disposed of in the trash. Lake County residents can bring their unwanted electronics to one of four year-round drop-off locations. This holiday season, remember what you should do on the road so you and those around you arrive safely to your holiday destination. The Lake County Sheriff’s Office is conducting a safety campaign now through Jan. 2 to make drivers aware about the dangers of impaired driving as well as enforce live-saving seat belt, speeding and distracted driving laws. Follow these life-saving tips!